Breakfast is served at 6.30 A.M. until 10.30 A.M. Full energy makes you ready for the day! 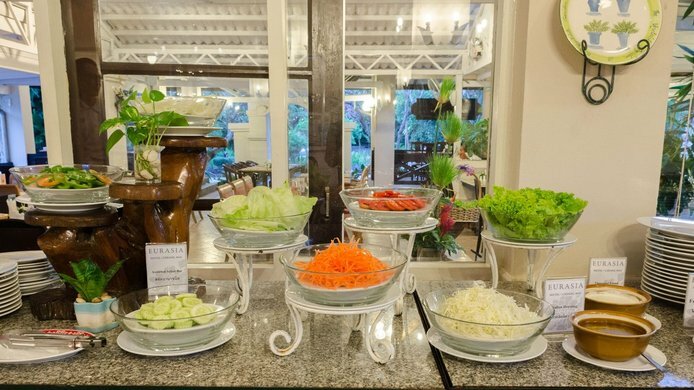 The Garden Terrace Restaurant served at 6.30 A.M. until 11.00 P.M. To spice up your meal and wake your taste buds, visit The Garden Terrace Restaurant for food and drink experiences. Swimming pool : Open time at 7.00 A.M. until 7.00 P.M. Spending your lazy day at outdoor swimming pool. Shuttle bus service : Departure from hotel to Chiang Mai Night Bazaar : 10:00 am, 2:00 pm, 6:00 pm. And 10:00 pm. Shuttle bus service :Pick up from Chiang Mai Night Bazaar ( Meeting point at The imperial Mae Ping Hotel or Thapae Gate) : 2:30 pm, 6:30 pm. and 10.30 pm. Airport transfer : Complimentary airport transfer for all guest who booked direct property or hotel website. Air Conditioning : Relaxing at your room after enjoyed your Chiang Mai’s excursions. CCTV With 24 Hours Monitoring : 24-hours CCTV monitoring for all areas for our guests can feel safe and secure during their stay. Smoking Area : Please do not smoke inside the guest’s room, common area. The smoking area is provided. Doctor service : Doctor on call 24 hours service with additional charge. ​Safe deposit box : Personal safe deposit box are provided for all guest’s room. Luggage : Once a guest check out, he/she may leave the luggage for maximum of 30 days but we will not be responsible for any losses of damage.